This Frozen Vanilla Mango Yogurt with Lime is about the quickest sweet treat you will ever make. It’s so quick it’s almost instant, but I like to put it in the freezer for about an hour or so to firm up. My sister reminded me recently of how we would buy an ice cream cone from our local mall in the middle of winter and eat it while we walked home. We would still be eating it when we got home which would give our Mom the shivers. I know that frozen yogurt isn’t usually the first thing people think of for a sweet treat in the middle of the winter. Especially when it’s – 30 ° out. But, I don’t really mind the cold so much. I stay nice and warm bundled up in all my favourite winter gear. What I miss during the long winter months is colour. I miss the green grass, leaves on the trees, a burst of colour from my garden and even the colourful clothes that everyone wears. So, that’s what appeals to me with this Frozen Vanilla Mango Yogurt with Lime. I love the tropical mango, the heavenly scent of vanilla, the fresh burst of lime and the coolness of the frozen yogurt. It is very refreshing, even on a cold winter day. 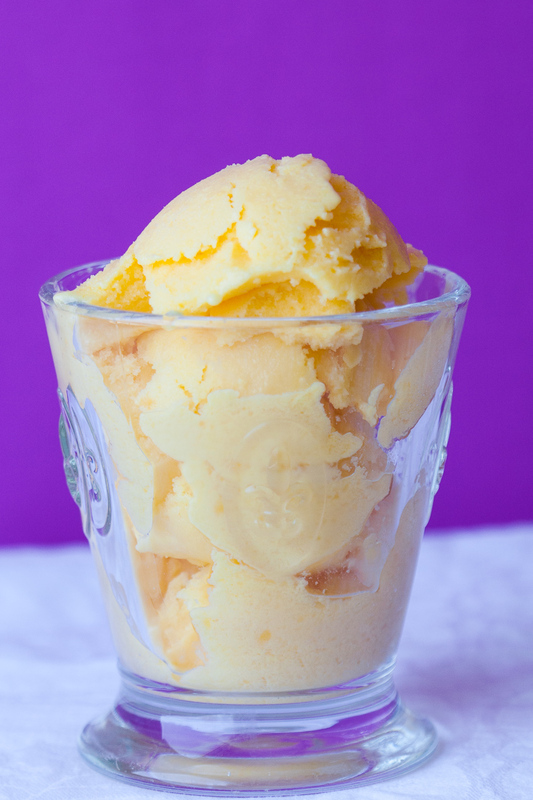 You can make this Frozen Vanilla Mango Yogurt with Lime in a snap. 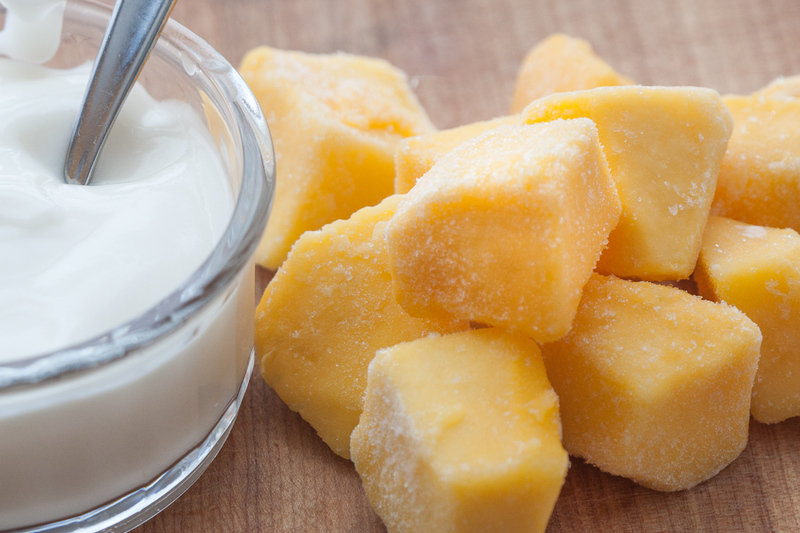 Just take a tub of your favourite vanilla yogurt, a bag of frozen mangoes and puree in your food processor or blender. Blend it together until all the mangoes chunks are blended into the yogurt. You can eat it right away, as a kind of soft serve ice cream…but I like it firmer, so I pop it in the freezer for about 1-2 hours. Pour frozen yogurt into food processor or blender. Blend until all frozen mango is blended thoroughly with yogurt. Add lime juice, and pulse for 30-60 seconds. Transfer to a shallow rectangular container. Place in freezer until firm (about 1-2 hours, depending on your freezer). I made a few batches of freezer jam recently and I have to say, I am really loving the stuff! Before I tried freezer jam, I made regular jam: I would boil up fruit and sugar and other flavourings on the stove in a big huge pot. Quite often I had to boil the mixture hard, and the mixture would bubble up until it almost overflowed all over my stove. After skimming off the foamy bits, I would pour the jam very carefully into many sterilized jars. wipe the rim, put the sterilized lids on the jars and wait for them to pop when they cooled down and sealed up tight. It was fun, but a lot of work. Freezer jam is a whole different ball game. It took about 20 minutes for me to make 3 jars. Done. And the jam tastes so fresh, just like local berries. I put the jam in special plastic jam jars (the glass jar photographed better) and after the jam sits for 24 hours, in the freezer they go! And oh my goodness! The fresh strawberry taste! So good! The jam tastes amazing right now, but the real treat is eating Summery Strawberry Freezer Jam on toast in February when it’s snowing outside and the temperature is -25. 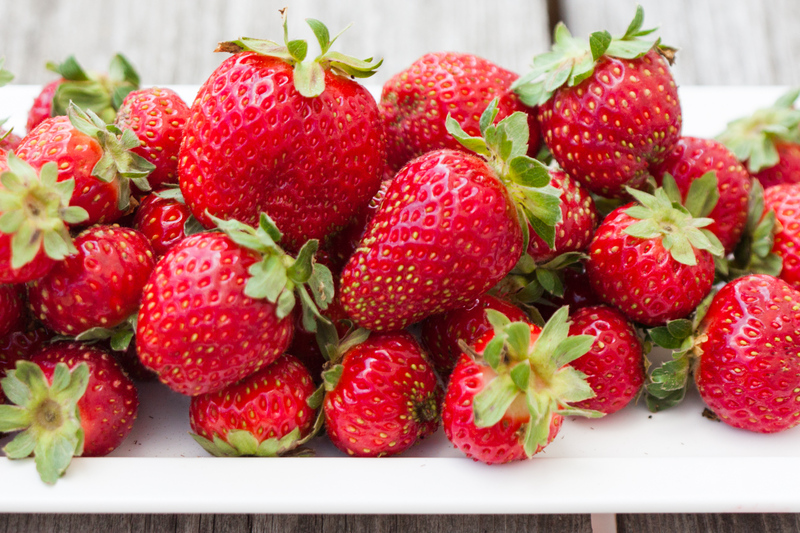 Just the aroma alone from the strawberries brings back summery memories in an instant and will warm you to your toes. Up until a couple of years ago, I was only able to make Strawberry Jam in June. Our strawberry season used to only last about 3 weeks, then they were done. But our local fruit stand has started growing and selling Day Neutral Strawberries. Day Neutral Strawberries are ever-bearing plants that continue to produce fruit until the frost, so well into October. So, now I can make strawberry jam in the cooler weather. It’s hard to wrap my head around seeing baskets of strawberries next to peaches, corn on the cob and tomatoes. But, I think it’s something I can get used to. Hey! What’s your favourite jam? Send me a message. I love homemade jam. You will need two pots to make this jam. Wash and hull the strawberries. Slice them and place in a bowl or if you have an 8 cup measuring cup, that works great! When you have one layer of strawberries, crush them with a pastry blender, or a fork. Continue crushing the strawberries, until you have 3 cups of crushed berries. Pour the berries into a large pot. Add the sugar. Heat until the sugar is dissolved. Meanwhile, place 3/4 cup of water and one pouch of powdered certo in a small pot. Bring to a boil, and boil for 3 minutes. Pour certo mixture into warm strawberries and sugar. Stir until all ingredients are well incorporated. Pour into plastic jam jars. 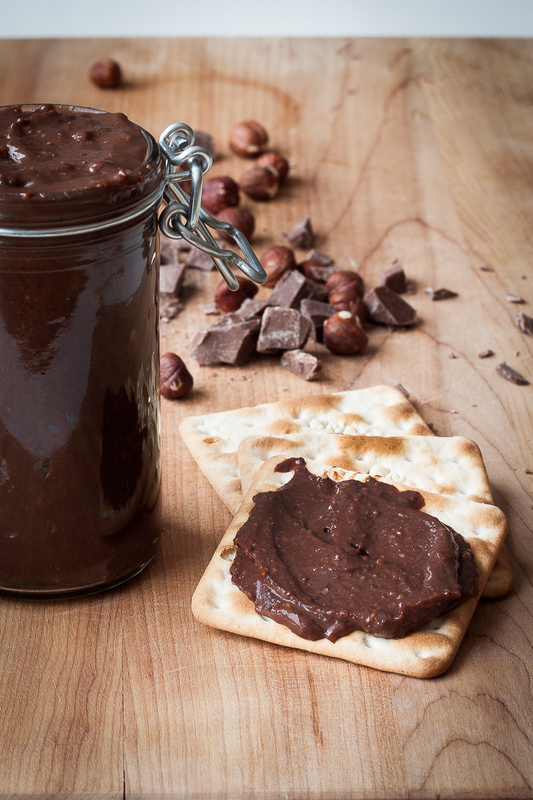 Let the jars sit on your counter for 24 hours. Then place in refrigerator or freezer. Don't forget to label the jars with the name and the date. These instructions are different than on the certo box, but they work the best for me. Wow! I’m not sure what the weather is like where you’re living, but the forecast for tomorrow in Ottawa is 40 degrees C. That’s hot, hot, hot! And the best way for me to stay cool in hot, humid weather is by eating fruity frozen desserts. This Strawberry Lime Elderflower Granita is so perfect for cooling down in the heat. Granita is a frozen mixture of fruit, sugar, water. It is the simplest frozen dessert you can make. And it’s a great dessert to make with your kids. Granita is similar to sorbet but is made without an ice cream machine. The ice crystals that form are large and coarse and will be crunchy when you take a bite, but seconds later the granita will just melt away in your mouth. Divine. To make granita, simply puree some fruit, water, sugar and any extra flavouring you may want to use, in a blender. Pour it into a shallow tray and place in the freezer. Check on it after an hour, and if it has begun to freeze, start breaking up the crystals with a fork. Place it back in the freezer for another 30-45 minutes. Repeat this process until it is all frozen and flaky. There are many ways to enjoy granita. Of course, you can eat it plain in a bowl. You could also have it layered with whipped cream in a parfait glass. Some people also enjoy it spooned overtop of yogurt. 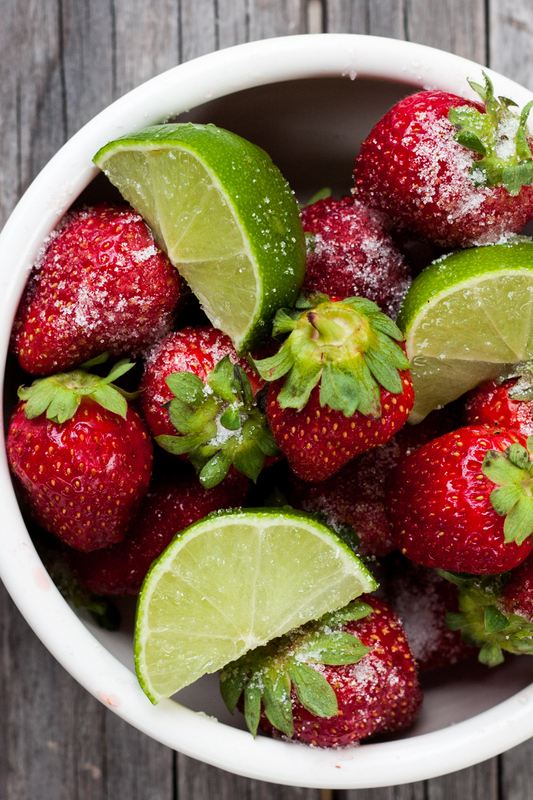 Strawberries have always been very symbolic of summer and a perfect fruit to use in granitas. But now with day-neutral strawberries, we can buy local strawberries until the frost hits! Yay! 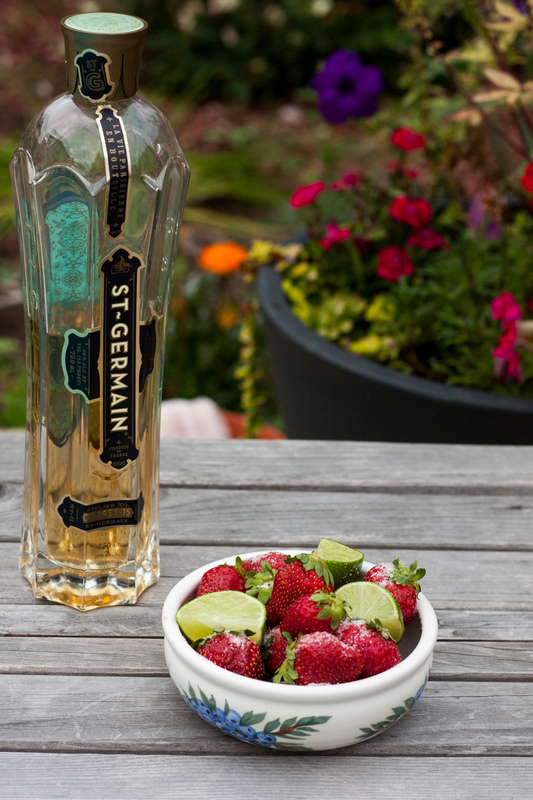 Strawberries and limes go amazingly well together. And when you add a few drops of Elderflower Liqueur…the flavour is heavenly. 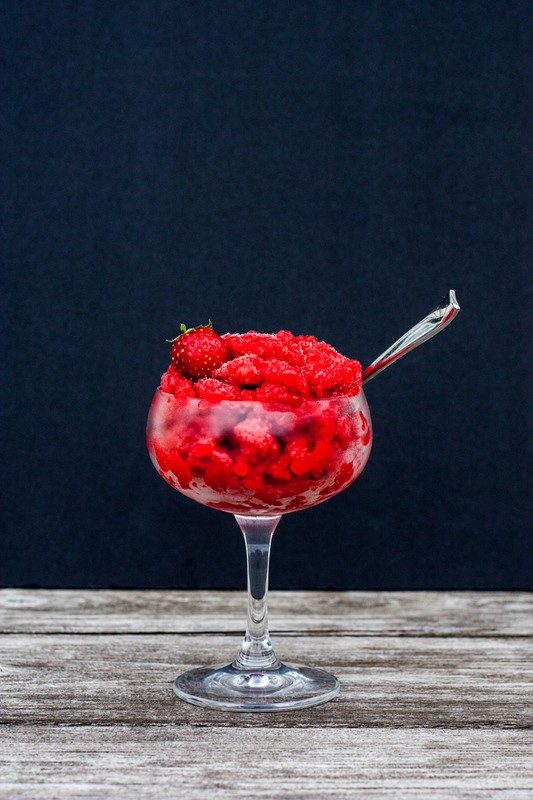 There are so many fruits you could use in granita: blueberry, melon, watermelon, raspberry, blackberry, mango, or espresso coffee…. or mix them up and come up with your own flavour. The possibilities are endless. Mix strawberries and icing sugar. Let sit one hour. Place strawberry sugar mixture into a blender. Add lime juice, lime zest, water and elderflower liqueur (if using). Blitz on high until a smooth puree is formed. Strain mixture through one layer of cheesecloth to remove seeds. Pour mixture into a rectangular shallow container and cover with lid. Place in freezer. After one hour, check mixture. If ice crystals have started to form, rake a fork through the crystals to break them up somewhat. You don't want the tray to freeze into a giant ice cube. Keep checking every 30 to 45 minutes and continue to break up the frozen parts with a fork. When it's ready, the tray will be filled with fluffy ice crystals. Enjoy on it's own, or layered with whipped cream, or overtop of yogurt. 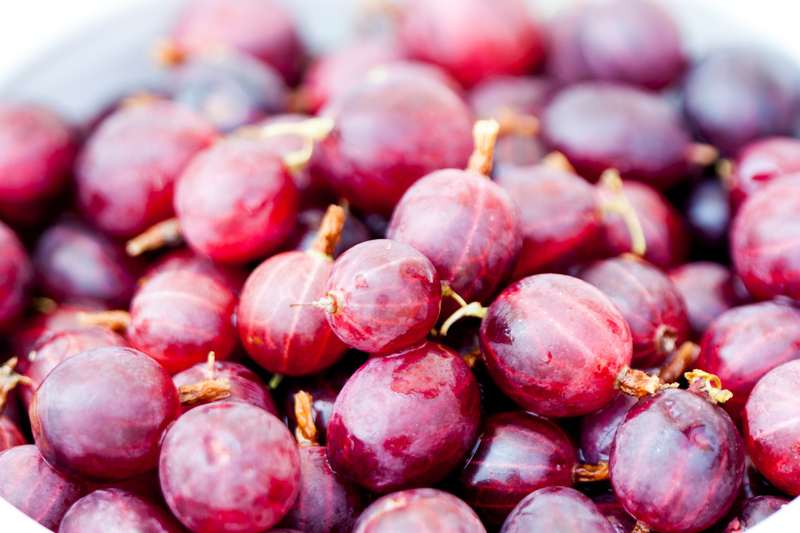 Red gooseberries are super beautiful: a lovely fuschia red, like a grape, but with very attractive pin stripes running down the length of the berry. They’re not very popular where I live. So, when I spotted a basket in a shop on our way out of Quebec City last week, I just had to grab them. Gooseberries always remind me of my Mum. The first time I ever saw a gooseberry bush was on a family holiday in England. She loved to point out anything that was authentically British to remind us of her roots. 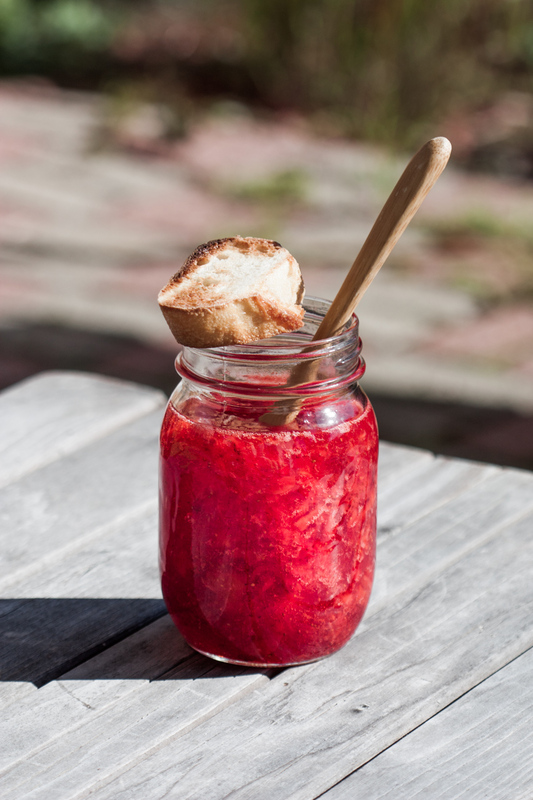 Homemade jam is SOOOO good! 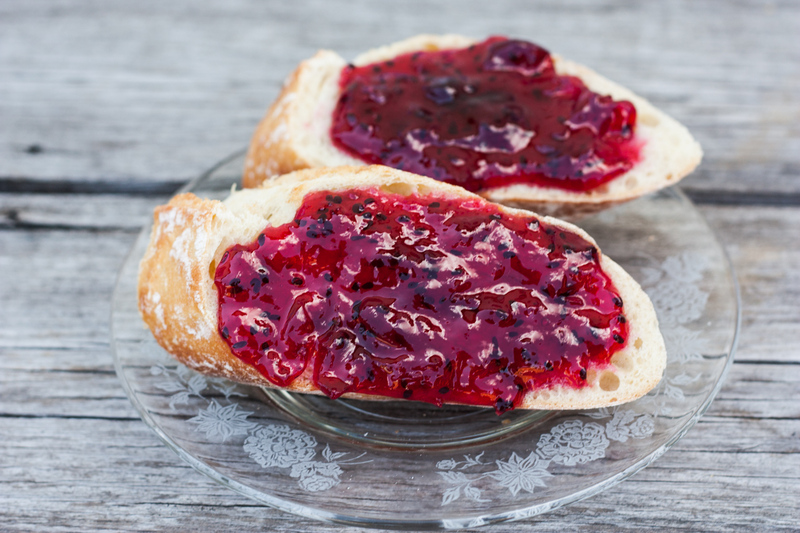 When we were young, we only ever ate homemade jam. I do not recall eating store bought jam until I was a teenager. Lucky me!! My Mum mostly made raspberry jam from the raspberry bushes that we grew in the backyard. My sister and I would help pick them. Dad would tie skippy peanut butter tins around our waist with twine and off we would go to pick berries. After they were all picked and washed up, Mum would make loads of raspberry jam. She made one large jar for each of the kids and one large jar for her and my dad to share. 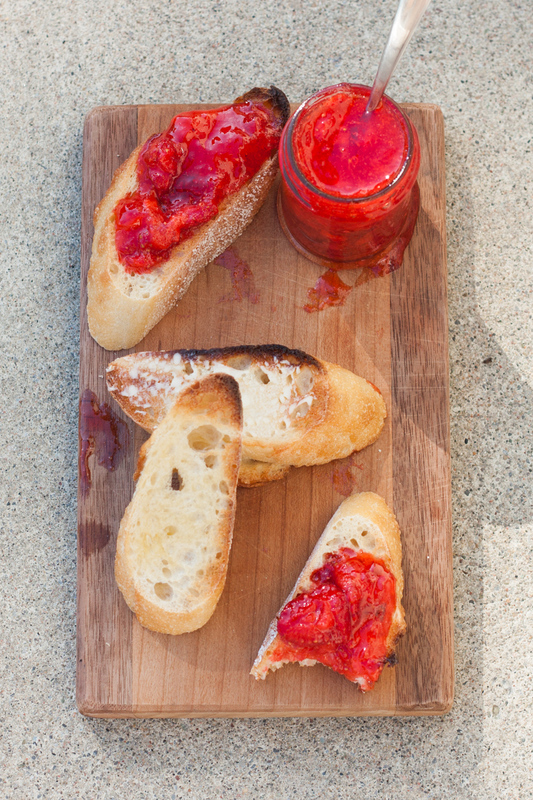 After we had finished our individual jar of jam, there wouldn’t be anymore until the following summer. My Dad grew up on a farm, so growing a couple dozen raspberry bushes, picking the berries and making them into jam, was second nature to him. My Mum, on the other hand, grew up in a city. Her mom died when she was only 2 years old, so she grew up with housekeepers throughout the school year and in the summer was shuttled off to various Aunties’ houses in the country. Farming or jam making was not in her blood. But she did it without complaining, because it made us all happy. She did love cooking and making preserves, so I know there was a part of her that loved it. 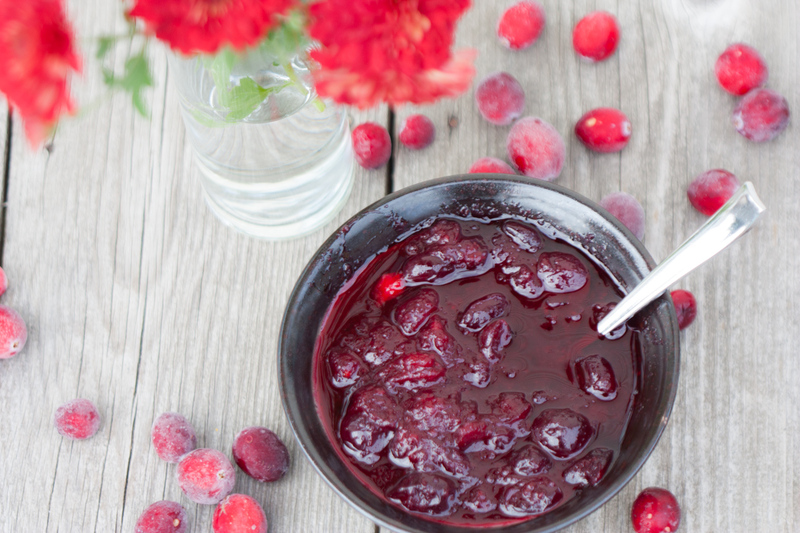 This Red Gooseberry Elderflower Jam is super easy to make. 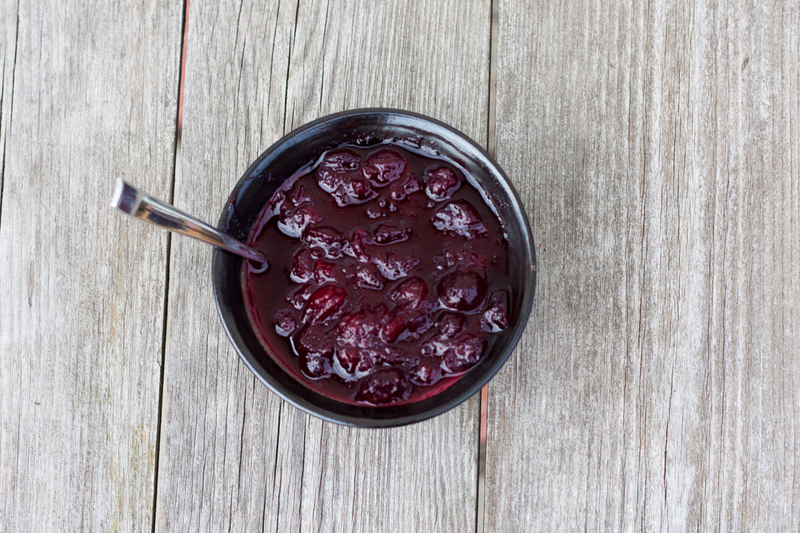 There is so much natural pectin in the gooseberries that you do not need to add any extra. All you need for this recipe is fruit, water, sugar and the optional liqueur if you want a boost in flavour. 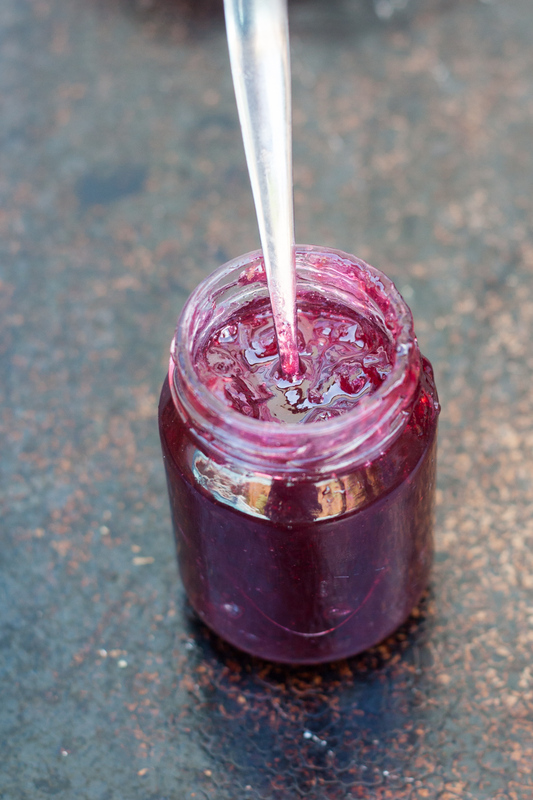 I love the smell of homemade jam in the kitchen: fruity, sugary, warm and steamy. 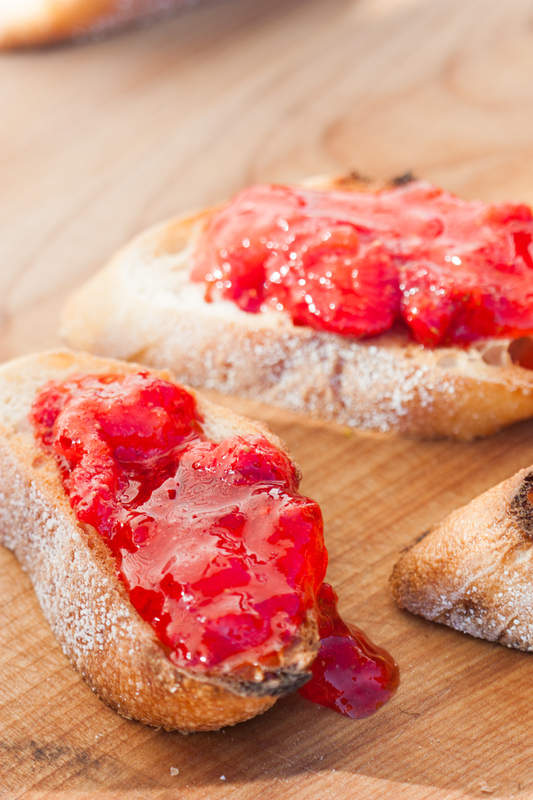 There is nothing better than homemade jam spread on fresh baguette. Yum. Top and tail the gooseberries. This is done by removing the stem and the very tiny end, if it's a bit nubby. Add red gooseberries and water to pan. Bring to a boil, then reduce the heat to let the fruit simmer for about 10-15 minutes, until the gooseberries become very soft and pulpy. Add sugar and on a low heat, stir the mixture until the sugar is all dissolved. Do not boil. Add the liqueur. Bring to a hard boil for about 5 minutes. 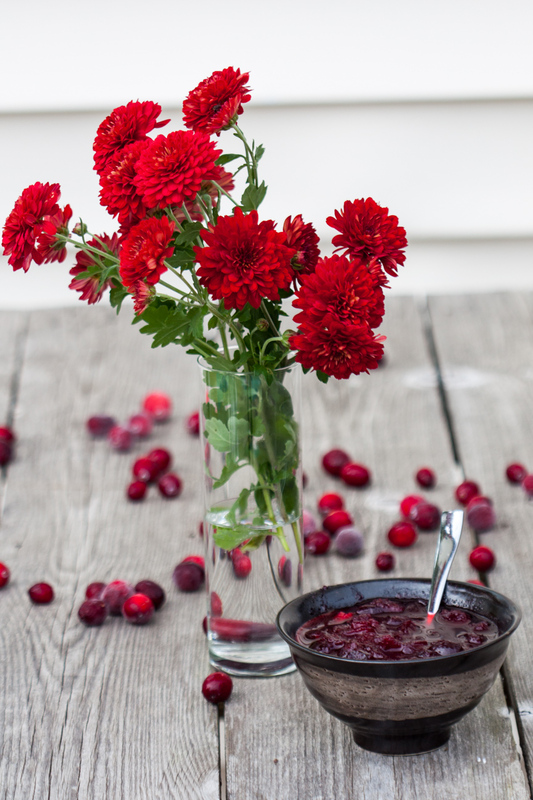 To check if the jam has set, pour some in a small dish and place in the freezer. After one minute or so, remove dish, if there is a skin on top of the jam, it is ready. If not, continue this method of cooking, and testing in a small dish in the freezer, until you see a light skin on top of the jam. This shows that the jam will set nicely when cold. Pour the jam into the jars. With all this hot weather we’ve been having, all I want to eat is ice cream. I just want to sit in a floaty chair in the pool and eat a big frosty bowl of ice cream – summer at it’s finest. 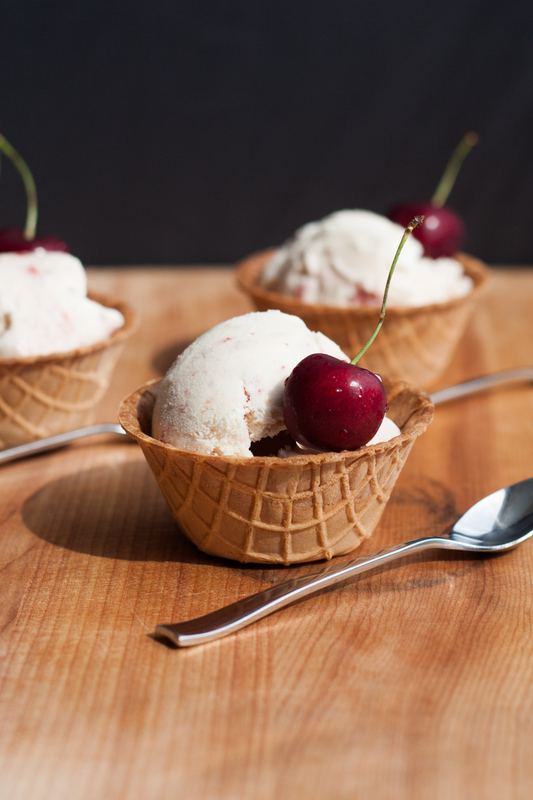 So, when I bought my annual 20 pound bucket of sour cherries awhile ago from our local supermarket, ice cream was the first thing that I thought of to make. 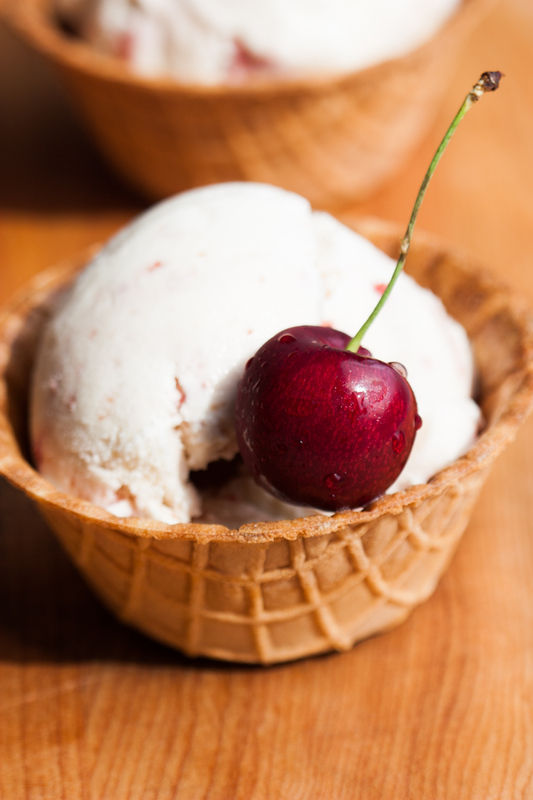 This combination of Honey-Vanilla Ice Cream with Cherry-Galliano Swirl is so perfect on a hot summer day! When we were little, my sister and I always chose the wildest flavours of ice cream we could find. We had a favourite ice cream parlour, Donna’s Lunch in Burford, Ontario, which was on the way to our grandmother’s house. We loved going there and were always excited to see what new flavours she would have. Everyone one else in our family ordered the traditional vanilla, strawberry or chocolate flavours. But Ruth and I loved the craziest, at the time, of flavours: bubble gum, cotton candy, blueberry swirl and our favourite to this day, tiger tail. A few wild flavours that I’ve seen in Ottawa lately are: Hong Kong Milk Tea, Fruit Loops Cereal Milk from Moo Shu Ice Cream Shop; Unicorn and Pink Grapefruit from The Beachconers Microcreamery; and Ferrero Rocher and Raffaelo + Coconut from Stella Luna Gelato Shop. It seems like when it comes to ice cream, anything goes. The Galliano in this recipe is optional, but really boosts the flavour. Galliano is a vanilla flavour liqueur. It was originally produced in 1896 in Tuscany, Italy by a local distiller named Arturo Vaccari. He named this liqueur after Giuseppe Galliano, an italian hero of the First Italo-Ethiopian War. If you don’t have Galliano you could substitute it with brandy or another vanilla liqueur, or just leave it out. It will still taste amazing. Heat 1 cup of cream and 1 cup of milk together with the honey until warm and honey is melted. You can do this on the stove top or in the microwave. Don't get the milk too hot to avoid forming a skin on top of the liquid. Place the mixture in a container in the refrigerator for a few hours, or overnight, until it is very cold. After it is cold, add the remaining 1 cup of cream. Place in your ice cream maker and follow instructions. For the swirl, heat the cherries and sugar until the sugar is dissolved thoroughly. This can also be done in the microwave or on top of the stove. Place this mixture in a container in the refrigerator for several hours or overnight until cold. When the cherry/sugar mixture is cold, blitz in your food processor or blender until the cherries are very finely chopped. Add the galliano. Pour churned ice cream into a rectangular or square container that can go in the freezer. Pour the cold Cherry-Galliano mixture in two lines on top of the soft ice cream. Draw figure eights through the cherry and ice cream to create a swirly pattern. Do this until the cherries are swirled throughout the ice cream. If you do it too much, you will have less of a swirl, but the ice cream will still taste amazing. Place in freezer for several hours or preferably overnight. Serve in a bowl, cone or waffle bowls. 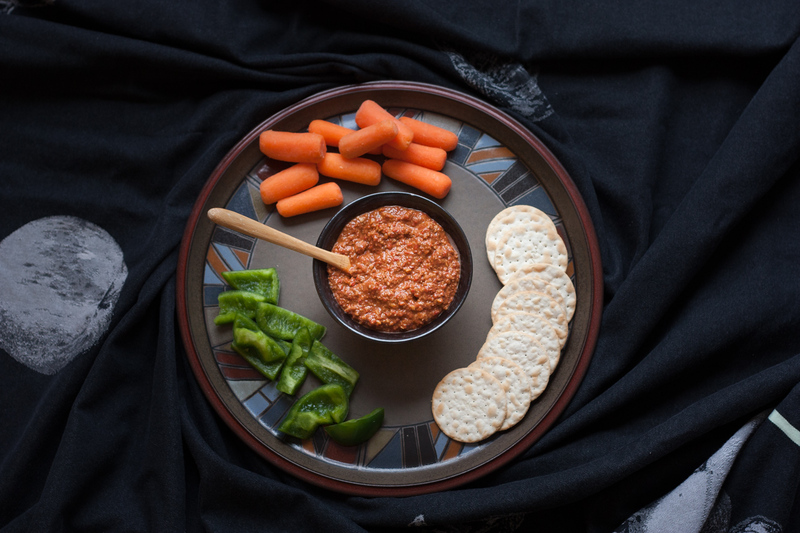 I made this Syrian Muhammara Red Pepper Dip recently for my family and everyone loved it. With spring and summer weather just around the corner, I am building up my repertoire of dips, spreads and salad dressings etc. for summer barbeques, picnics and pool parties. 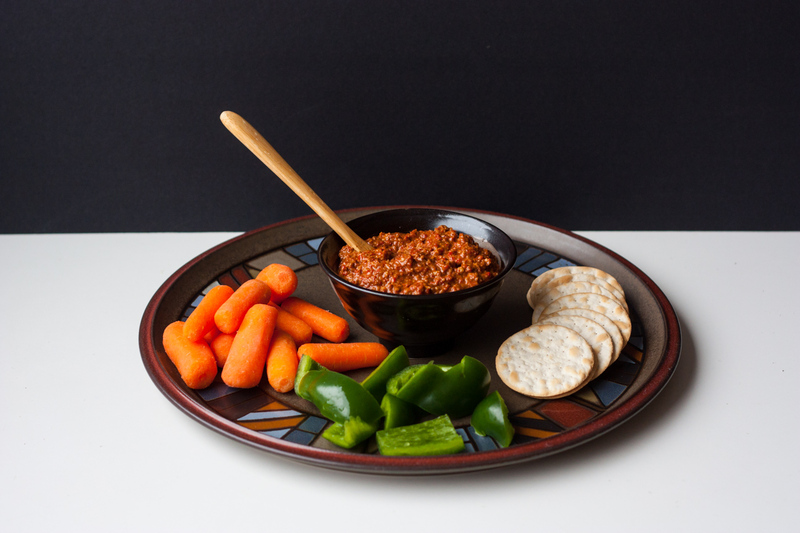 This dip has a beautiful red hue as well as contrasting flavours with the crunchy walnuts, smoky, silky smooth roasted red peppers and rich earthy cumin. This recipe is a surefire winner. It’s a vegan dish and is perfect for taking to someone’s house for a potluck. My recipe is not gluten free, as it has breadcrumbs in it. However, I’m sure it would be fine it you left them out. The texture would just be a bit different. This dip is popular in Syria as well as Turkey. Syria, is bordered by Lebanon, Turkey, Iraq and Jordan. These countries blend the cuisines of western Asia, Eastern Mediterranean, northeast Africa and northwest of the Arabian Peninsula which makes the food from these countries very, very interesting. I don’t really know much about this region, but some of the ingredients from this region that I am familiar with motivate me to learn more. Muahammara is a common dish that many families in Syria or Turkey eat almost daily. Many women in that part of the world keep peppers in the freezer to have on hand so they can whip up this dip if someone pops by for a visit. Some people make this with garlic, but I decided to leave it out, as I put garlic in so many recipes. I really wanted to taste the other ingredients. But you can add in a chopped clove of garlic if you wish. 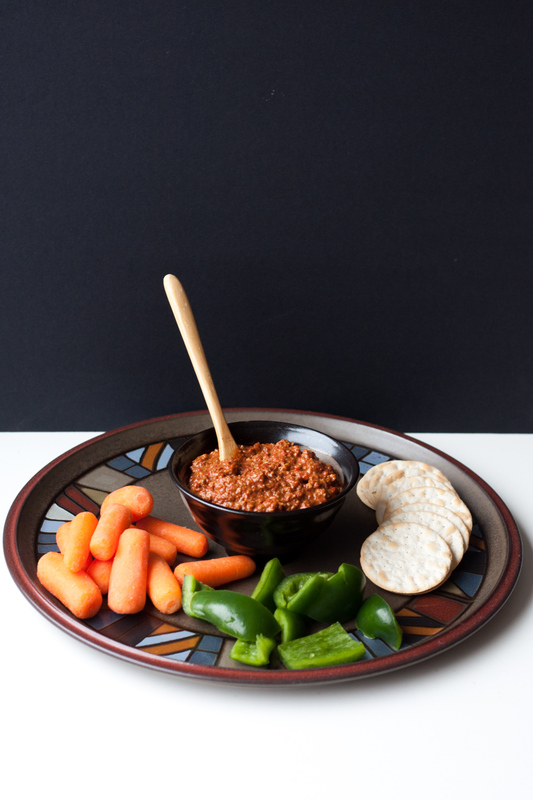 Muhammara is seasoned with lemon juice, salt and cayenne pepper. You can adjust those flavours as you like them. I hope you enjoy this dish! Let me know how you like it. 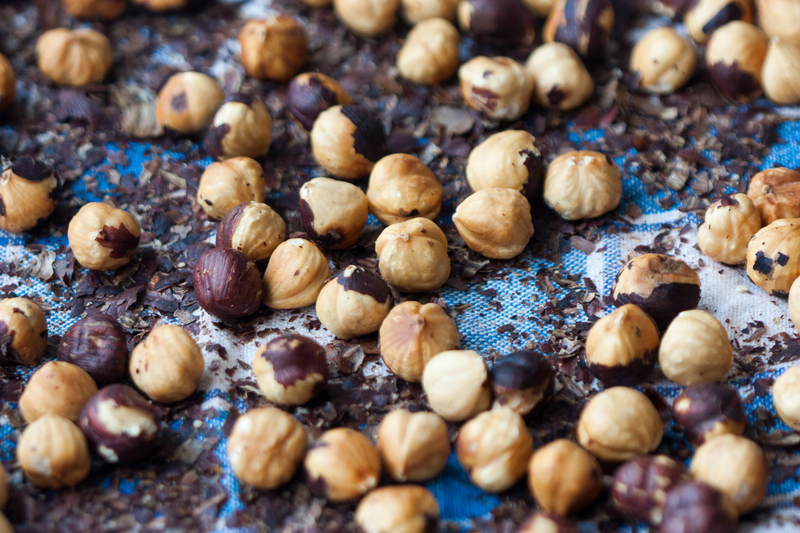 Toast the walnuts in a dry skillet until fragrant and slightly golden brown. Place red peppers, walnuts, bread crumbs, molasses, lemon juice, cumin and cayenne pepper in food processor. Pulse until smooth, but still coarse. 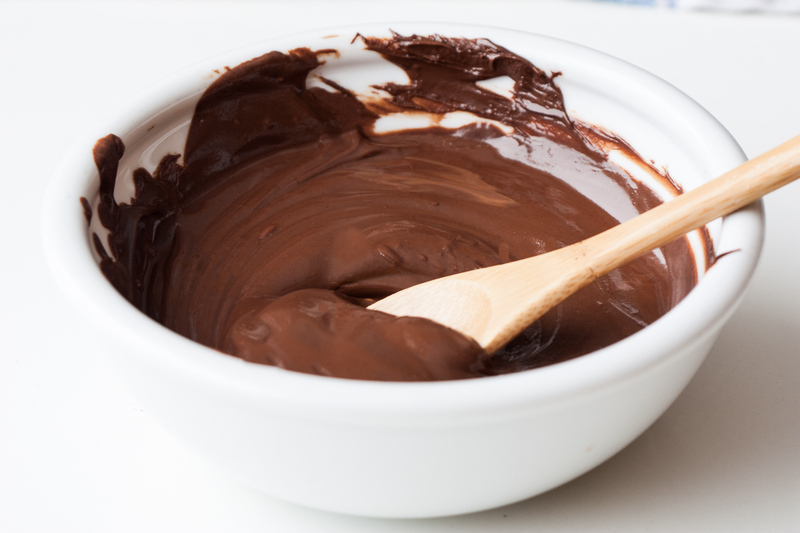 Pour dip into a serving bowl or tupperware container and place in fridge for a minimum of 15 minutes. This dip tastes best after a few hours or even the next day and is best eaten at room temperature.But is still perfectly fine if eaten immediately. Season with salt, and adjust lemon juice and cayenne pepper to your liking. Serve with raw vegetables, crackers and/or pita bread. 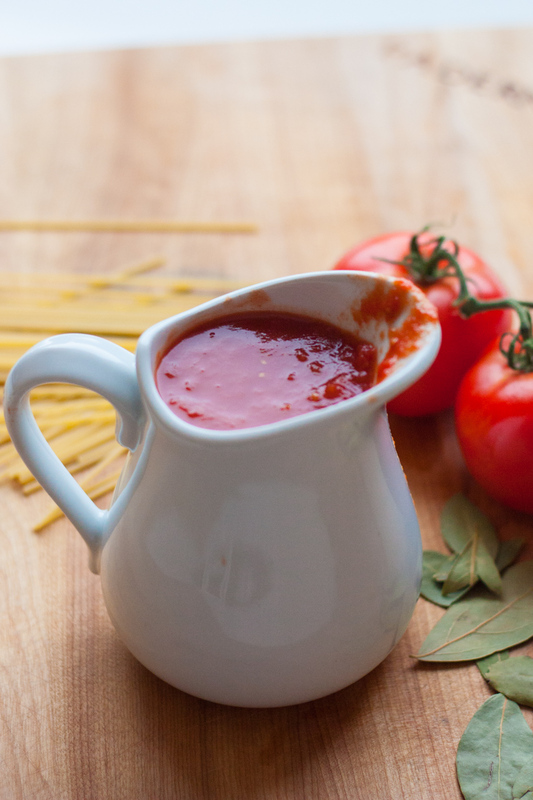 Tomato Sauce is one of the simplest pantry items anyone can make. It also freezes beautifully. It’s so handy to have a few tubs in the freezer so whenever I have time to make some sauce, I make double or triple the amount and freeze it for a quick dinner. You can make SO many quick dinners when there is a ready made tub of tomato sauce in your freezer: pasta + sauce + parmesan cheese; pasta + sauce + sausage; pasta + sauce + any green vegetable from the crisper drawer such as spinach, zucchini, or even just onion or garlic; or tortellini + sauce + parmesan. Homemade sauce is so simple, and so much tastier than store bought that I try not to purchase bottled sauce too often. It is also more economical and healthier as there is much less salt. 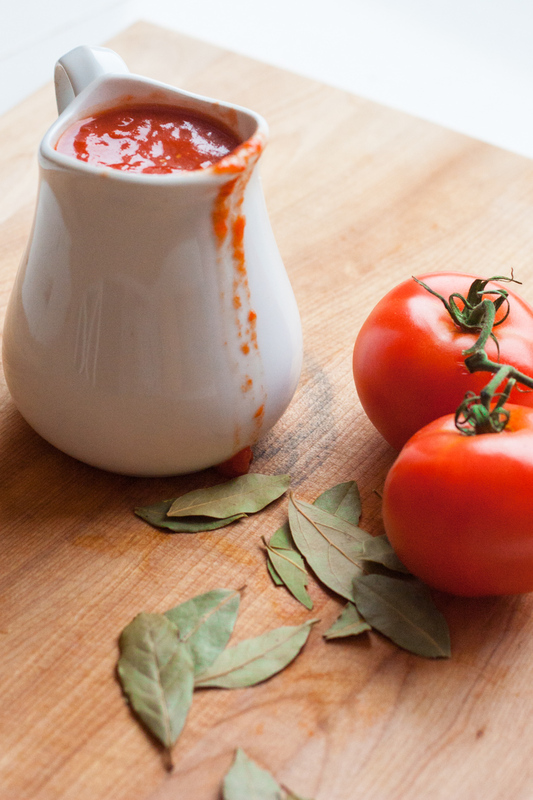 This Robust Red Tomato Sauce is my go-to sauce for all pasta or pizza dishes. I love it because it has a very deep rich tomato flavour. I know other people like to add onions, garlic and sometimes carrots for sweetness, but I like the rich tomato flavour scented with only bay leaves. If you are lucky enough to have a vegetable patch in your yard, or perhaps you rent an allotment garden, you could try growing your own tomatoes. 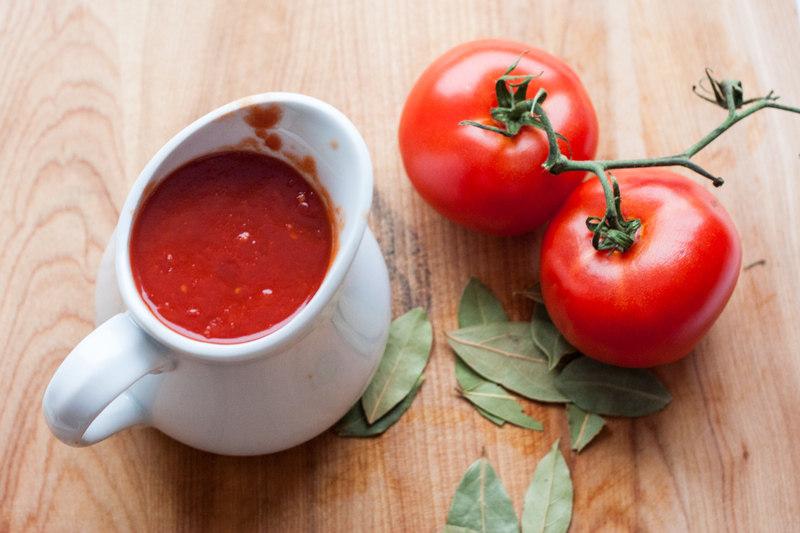 Tomatoes used to make sauce are a different variety than eating tomatoes. You’ll want to look for paste tomatoes. Paste tomatoes have fewer seeds and have a firmer texture. They also all ripen at the same time, so processing the tomatoes into sauce is easy. 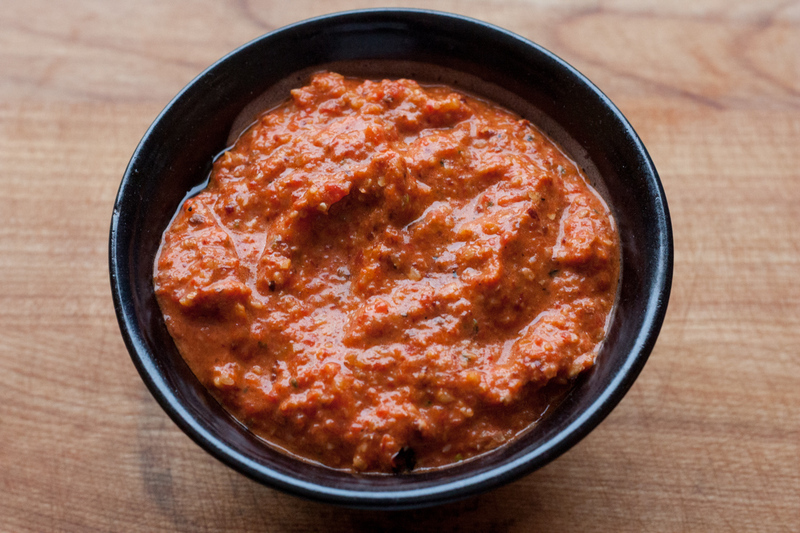 Paste tomatoes may seem a bit bland when eaten raw, but when cooked down, they turn into a delicious sauce. Some varieties to look for are: San Marzano, Amish or Roma. Personally, I buy whatever tins of tomatoes are on sale at the local grocery store. I also tend to buy tins with No Salt Added. However, if I am making a special pasta dish for guests or perhaps taking a lasagna to someone’s house, I would search out a more expensive brand such as Muir Glen, Eden Organic or San Marzano tinned tomatoes. These tomatoes do tend to have a richer and pastier texture. And the taste is divine. Winter is the perfect time for making tomato sauce and all the accompanying pasta dishes. So, next time you’re at the grocery store, pick up a few tins of tomato sauce and simmer them on the stove while you browse through your favorite italian cookbook and bookmark a few italian dishes to make with your gorgeous homemade tomato sauce. Empty the can of tomatoes into a large pot. Squish all the tomatoes with your hands until well broken up. Simmer on low for about 30 - 40 minutes, until reduced by about 1/3, with the lid half covering the pot. Add tomato paste to taste. I usually add about 2-3 tablespoons. This recipe multiplies well. Increase the cooking time to about an hour for large batches. It should reduce by about 1/3. January is a great month to make changes to your daily life. Maybe you want to hit the gym more often, go to the theatre or read more books. This year, I’m going to be cooking a lot more vegetarian and vegan recipes. I’ve been experimenting lately with some different dinner ideas and they have all gone down a treat. 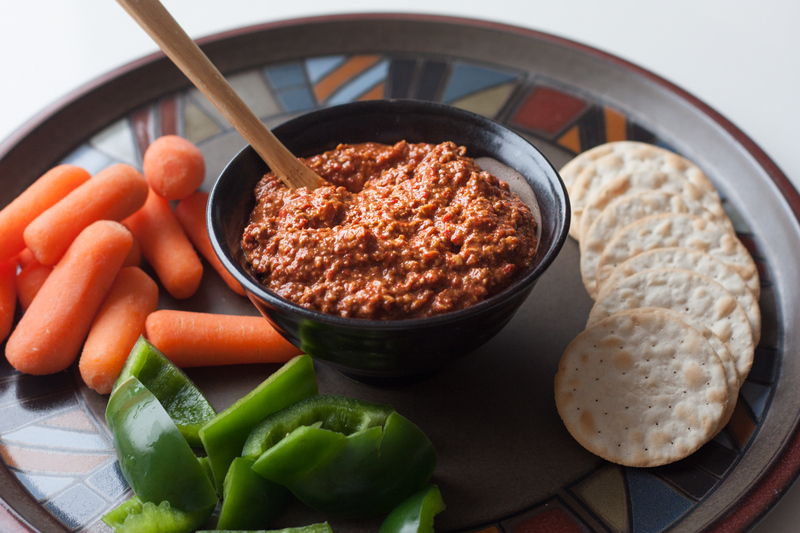 This vegan roasted red pepper pesto caught everyone offguard with it’s smoky flavour and heat from the chipotle. Eating less meat and more vegetables is a much healthier and more economical way of dining. I found this recipe recently in Meatless: More than 200 of the Very Best Vegetarian Recipes and everyone in the family loved it. I was a vegetarian for a few years when I was a teenager. Eliminating meat from my diet was easy, but back then, there were not many resources to inspire me to make interesting meatless meals. To make sure that I got enough protein in my diet, I ate a lot of eggs and cheese, and salty sunflower seeds. Nowadays, there are SO many amazing vegetarian ideas. I love Buddha bowls, vegetarian curries as well as all the wild variations on pesto. I love the influence that international cuisines bring to vegan and vegetarian dishes. Spices and techniques from Thailand, Vietnam, India or South America really liven up our local veggies. We’re so lucky that international restaurants, recipes and ingredients have become more prevalent. While I am familiar with vegetarian diets, the vegan diet is new to me, and perhaps to other people as well. 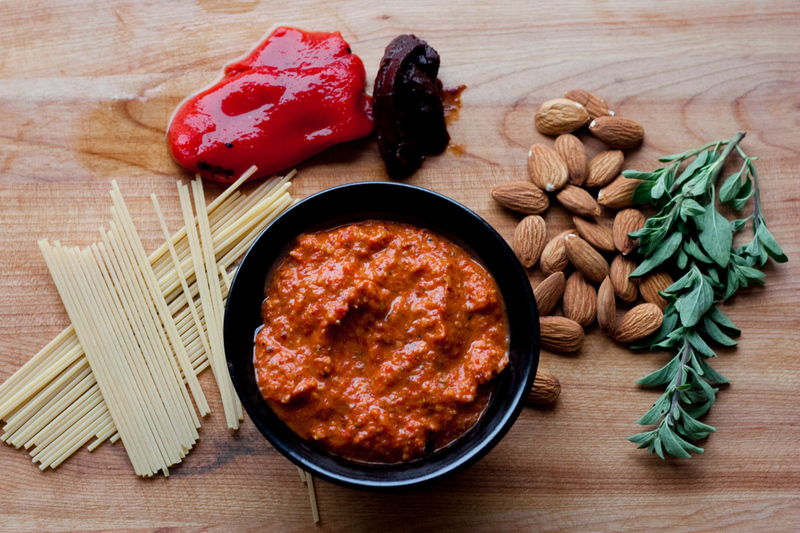 This vegan roasted red pepper pesto is amazing with it’s smoky hot chipotle peppers and nutty almonds. It does have quite a kick to it from the chipotle pepper. If you are serving this to anyone who does not like spicy food, decrease the chipotle pepper to 1/4 or 1/2 and add an extra half roasted red pepper. It is delicious on pasta, but you could also spread it on crackers, or a bagel or have as a dip with veggies. Place all the ingredients in the food processor, EXCEPT the olive oil. Pulse a few times until roughly chopped. Add the olive oil and blend until everything is mixed together. Boil up 450 grams of spaghetti. Follow package instructions for timing. Toss the spaghetti with the pesto. To toast the almonds, spread them on a parchment lined baking tray and pop them into a preheated 350 degree C oven. It takes about ten minutes for them to toast. If you are interested in further reading on vegan diets, here is some additional reading. Enjoy!